Excuse the informality—I figured if the president can get down with the one-word subject line, I'd give it a whirl. I'm writing to announce that we're doing a one-night special event—I'm performing AMERICAN UTOPIAS, my monologue about Disney World, Burning Man, and Occupy Wall Street, on Thursday, December 13th at the McCarter Theater in Princeton, New Jersey. We're incredibly proud of UTOPIAS—we just finished a sold-out run in Chicago, and we think it might be our most fun monologue in years. This will be your LAST CHANCE to see it in the New York area—it's not currently booked to return, so I hope you'll join us. Starting today, you can get $20 TICKETS (!) by using the promo code UTOPIAS at the McCarter's site here. 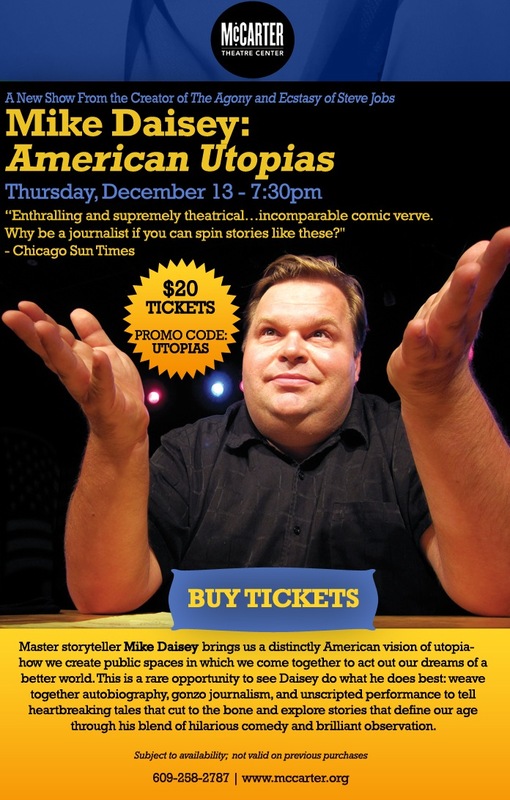 Master storyteller Mike Daisey brings us a distinctly American vision of utopia—how we create public spaces in which we come together to act out our dreams of a better world. Daisey takes us everywhere to pursue the story: from Disney World and its nostalgic theme park perfection, to the drug-fueled anarchic excesses of Burning Man, to Zuccotti Park, where in the unlikeliest place the Occupy movement is born. Gunplay, giant glittery dildos, raving animatronic presidents, and brutal police actions come together to paint the landscape of our American dream. Daisey’s groundbreaking monologues weave together autobiography, gonzo journalism, and unscripted performance to tell hilarious and heartbreaking stories that cut to the bone, exploring stories that define our age through his blend of hilarious comedy, brilliant observation, and pitch-perfect timing. This is a rare opportunity to see Daisey do what he does best: a master storyteller at the peak of his form, weaving new stories about the things that actually matter. "His shows have the insightful hostility of the best comedy." "Masterful and bombastically funny...a voluble and valuable raconteur." "There is nothing minimalist about this monologuist - if Lenny Bruce was embodied by Zero Mostel and played by Louis Armstrong, the result would be Mike Daisey."